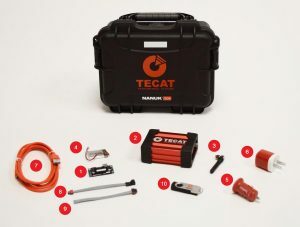 Released in 2016, the WISER 4000 system is TECAT’s low-cost, ultra-low power and extremely accurate strain sensor system. This proven wireless system has the optional ability to measure 3-axis acceleration, barometric pressure and ambient temperature, all within the same incredibly small footprint. The 4000 includes on-board data logging without PC or DAQ connectivity, and remote flash capability, which enables firmware upgrades without removing the system from the unit under test. Featuring shunt calibration, this WISER system is designed to simplify instrumentation verification for users, while allowing them to check calibration of the system in the field. In addition, the WISER 4000 has four programmable analog outputs, a high-speed recording, and is available with custom-built remote enclosures to protect the system’s remote unit and battery from damage due to debris. The magic of WISER is the unique design of the data acquisition system coupled with the high fidelity, real-time communications system, which delivers fully processed data ready for viewing directly from the source. All data can be stored directly in your DAQ with no lag time due to batching or aggregating the data sent from the sensor. The result is excellent real-time feedback. Visit our CONNECT PAGE to request a formal quotation for the WISER Model 4000 System.